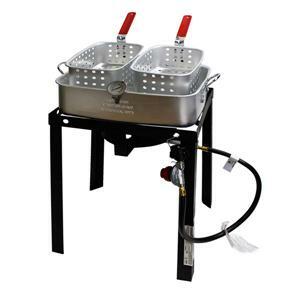 The Chard 18-quart Dual Basket Deep Fryer includes two 9-qt. capacity heavy-duty aluminum fry baskets perfect for large quantity deep frying. With a sturdy 21-inch 4-legged welded stand and a 50,000-BTU cast iron burner, this model can easily handle the largest jobs. It comes complete with a CSA-approved regulator with hose and a convenient 5" deep fry thermometer. Whether your frying fish, wings, french fries or your own specialty, Chard gives you the tools to make it yours! Cast iron & aluminum. Black/Aluminum.